Study in India versus Study Abroad - The Dilemma! What Ails Higher Education in Kerala? Have We Lost our Indian Culture of Education? Can We Create 'World-Class' Universities? University education system started in India in the year 1857. The first three universities, namely the university of Calcutta (Kolkata), Bombay (Mumbai) and Madras (Chennai) were started with the influence of the British education system, modeled around the University of London. Now, it has been long 160 years and Indian university education has undergone tremendous changes along with a colossal increase in the number of universities in India. Presently, India has 789 universities, including 47 central universities, 359 state universities, 123 deemed universities and 260 private universities. With the increasing number of universities, the focus should be laid on enhancing the quality with diversity, and less on the commercial opportunities. In India, most of the universities grab a student's attention through large rooms and huge campuses, but the quality aspects needs to be evaluated. To catch up the quality, the universities need to recognize the three essential elements, namely the physical infrastructure, academic reforms and a team of skilled faculty members. Further, the emphasis should be on the access of Indian students to global frontiers, which is possible through collaborations with international educational bodies. Many universities have fulfilled these quintessential and many more are in a move to achieve those. 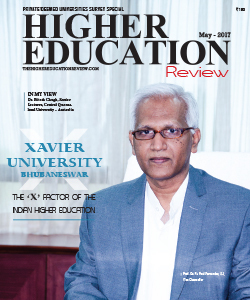 In this edition of the Higher Education Review magazine, we present "Top 25 Private/Deemed Universities in India." Through this edition, we like to bring out the names of some Universities that have already made a mark in the Indian education arena through their strong ideologies and innovative pedagogies. While the survey is conducted based on nominations received from the Universities, they have been evaluated and shortlisted by a panel of Educationalists, HR professionals and our Editorial team based on the data inputs provided by the Universities. 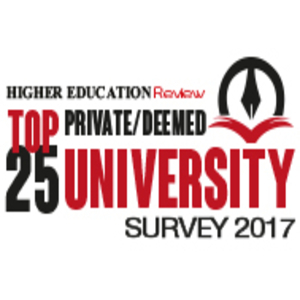 Welcome to the fourth edition of the Higher Education Review's Top 25 Private/Deemed Universities in India Survey. We at Higher Education Review have a good understanding of the latest trends in this sector and believe that a comprehensive mechanism to rank Private/Deemed Universities in the country is vital. While ranking each entry, our experts in the panel evaluated the entire checklists that are required to be the best Private/Deemed Universities in India. Selection Process, Eligibility Criteria, Scholarships, Academic and learning environment, Research volume, Influence, Reputation, Income, Infrastructure, Accommodations, Facilities, Impact on New knowledge and Ideas, Personality Development, Industry Income and Entrepreneurship were few among those stringent parameters. All of them were assigned a score based on their importance and cumulative score for all the parameters provided an overall data score. Based on these performance indicators, the rankings are designed to assess universities in five major areas: Academic Excellence, Infrastructure, Placement, University Background and Alumni Factor. This list of Top 25 Private/Deemed Universities is the final product of our research and our major objective is to arm students with extensive information that will facilitate their quest of identifying the best institute to pursue education in India. The survey also lists some of the newly established universities that have strong ideologies and innovative pedagogies under the Top 10 Emerging Universities in India category. We hope our efforts to create this exhaustive blue print elucidating the ideas about Private/ Deemed Universities help the student across the country to make accurate decisions about their study destinations.